CONNECT. We're connecting to your core and glutes in standing, kneeling and lying down exercises. Let's connect to the breath and core for better strength! keep one foot on the floor at all times during the back-lying core work. Congratulations, mama! You did it. 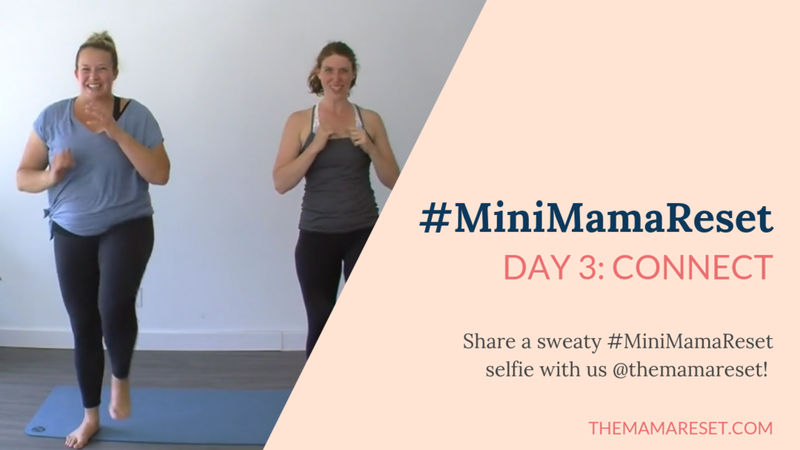 Now don't forget to head to Instagram to find us and share your success with the hashtag #MiniMamaReset so we can cheer you on! This is just a TASTE -- a somewhat silly, laid back and FUN TASTE -- of the movement portion of our signature #MamaReset program: 6 weeks to reset your core, total body strength, nutrition and mindset. Want A TOTAL LIFE Reset? GET ON THE INSIDER LIST FOR EXCLUSIVE DISCOUNTS + BONUSES WHEN #MAMARESET OPENS THIS FALL! USE AT YOUR OWN RISK: This website is for informational purposes only. Consult a physician before performing this or any exercise program. It is your responsibility to evaluate your own medical and physical condition, and to independently determine whether to perform, use or adapt any of the information or content on this website. Any exercise program may result in injury. By voluntarily undertaking any exercise displayed on this website, you assume the risk of any resulting injury.